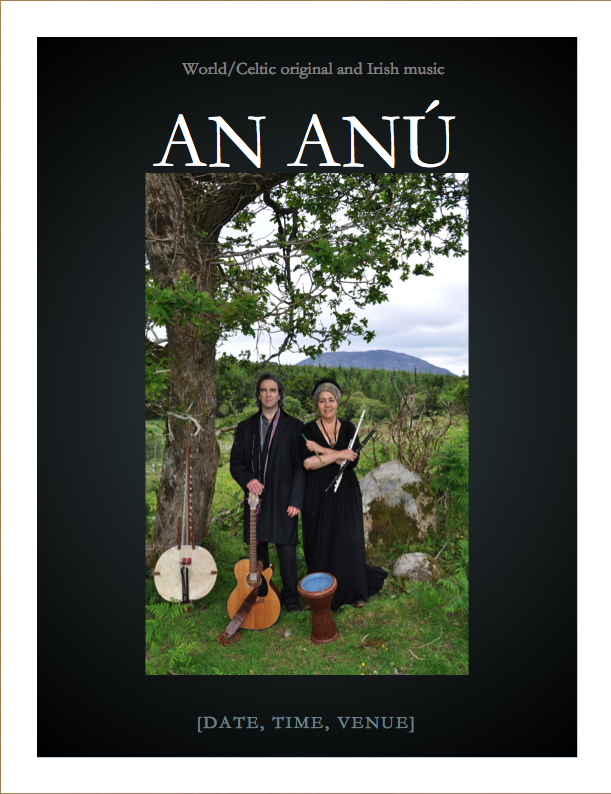 Anú is the Celtic Mother Earth/Creation Goddess, the queen of the ancient Irish race; Tuatha Dé Dannan; “An Anú” is an original World/Celtic musical collaboration between singer songwriters Liam Mac Amaíla and Helen Webb, featuring both original music and traditional Irish music. Seasoned artists and performers, they bring together vibrant “World” rhythms and Irish music, culture and mythology. Both powerful vocalists and accomplished musicians Helen and Liam bring a musical message rooted in mythology and history, spirituality, love and hope for the planet. Instruments include, kora (West African bridge harp), flute, Irish whistle, acoustic guitar, darbuka and banjo. You can listen to An Anú by clicking on the link at the bottom of this page. Liam is a singer/songwriter and musician with his musical roots in Connemara in the west of Ireland. He has toured extensively in America, the Uk and Europe performing beautifully crafted traditional and original ballads, and is known for his passionate,strong and inspiring vocal delivery. Liam’s main musical focus has been Celtic and traditional Irish with an emphasis on the music of Connemara and Clare. Liam’s music draws upon his Archaeological background and knowledge of ancient civilizations with references to ancient Irish mythology and folklore, to weave a tapestry of intrigue, and the magic of the ancients. This combined with Rythmns from Africa which are brought into the mix by Helen’s kora and percussion/drumming, creates a strong and original contemporary musical style which conveys their deep and spiritual love for nature and indigenous world cultures, with notably powerfully executed vocals from both artists. Helen is a vocalist, composer and musician with a string of performance credits ranging from Opera at Covent Garden to Rock and Soul in London’s West End, she is also an Ethnomusicologist with a background in African music and she is from a mixed race Carribbean/English background. Since arriving in Ireland with the intention of discovering more about the true spirit of Irish music, Helen has developed her flute and whistle skills and learned many Irish songs through immersing herself in the musical culture of the west. Her moving music carries a strong spiritual message of personal power and freedom, and is often based around traditional African riffs and cyclical patterns. Her powerful and emotive vocal style blends harmoniously with Liam’s, resulting in An Anú’s signature, passionate and impressive vocal delivery. A repertoire of original music and traditional songs and pieces performed in a concert setting, is woven, informally with a changing projected visual backdrop, and with short tales of mythology, folk law, ancient deities, fairy folk, and history, from the Neolithic to the early Christian period and the coming of St Patrick (circa 3,000 BC to AD 500) and on to the 17th century and the Flight of the Earls (which resulted in the loss of Ireland’s ancient Gaelic Chieftans and petty kingdoms). An Anú’s song “Native Son” tells this story, and draws attention to the plight of modern indigenous tribal cultures . For many visitors, the journey to Ireland is often a quest to connect with the ancient magic and wisdom which still exists in the culture of the west, and in many indigenous cultures throughout the world, such as the ancient Mande Region in West Africa and the Berber tribes, the original Inhabitants of North Africa. For many local people, there is a desire to keep this wisdom and magic alive through art and culture and to explore and revisit it regularly. Throughout the concert there will be brief tales, projected illustrations and photographs of mythological deities such as the Tuatha Dé Dannan, Anú, Dabh and Macha and Mananánn Mac Lir (who is associated with Manning Bay in Clifden). This Bronze Age divine tribe came to Ireland to free the people from the Formorians who had enslaved the people and the land of Ireland. 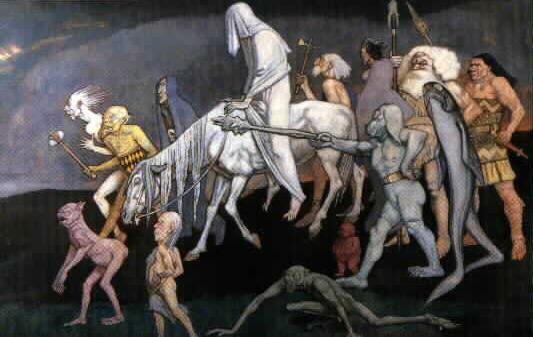 Their children such as Cú Chullain and Queen Maeve, were demi -gods and folk heroes. 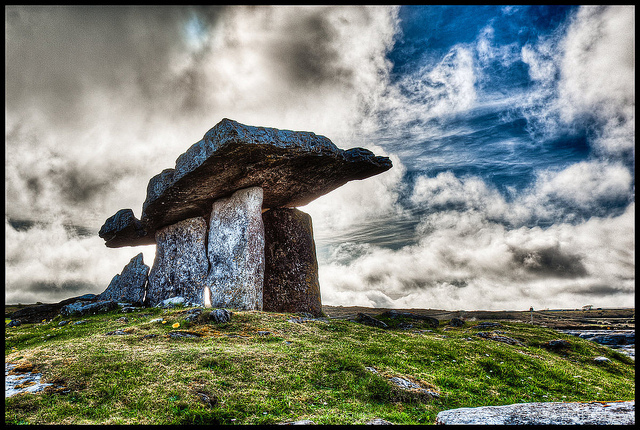 Legend holds that the Tuatha Dé Dannan first landed off the coast of Connemara. This story is told in An Anú’s haunting original composition“Children of the Light” with two voices, flute and acoustic guitar. 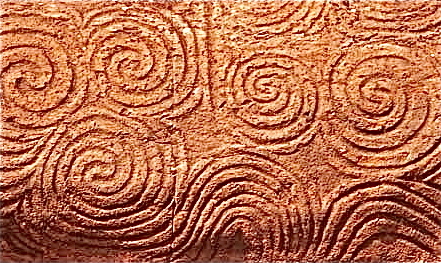 There will be images of scenery and monuments as a backdrop for songs and instrumentals (such as An Anú’s emotive interpretation of the ancient Irish air “The Coulin”). Twelve Pins, Clifden Bay, the Spanish Arch and the megalithic monuments and standing stones of north west Connemara to name a few. There will be short tales of the ancient African harp; the kora, and its repertoire and bardic tradition (such as in the ancient West African song “Kelefa Ba” performed by An Anú using the kora, or West African bridge harp). An Anú explore how this music and its associated myths and legends (such as tales of the Jinn; other worldly beings similar to the faeries who occupy each kora) may link in with the music and traditions of Connemara through the blending and mixing of ancient seafaring cultures from the west and the north of Africa to the west of Ireland in a relaxed, informative and creatively inspiring multimedia concert experience with high quality live music as the central core. This production aims to capture the imagination and inspire both local people and visitors with it’s strong musical content, presented in a concert setting and consisting of traditional and original pieces and songs. An Anú relate the music to the mythology and history of Ireland and the Atlantic seaboard stretching from the west coast of Africa to the west coast of Ireland using short, but highly informative spoken interjections. The visual aspect of the show consists of beautiful, colourful and transportive projected images of iconic legendary and mythological characters and places, historical evidence and informative images on the theme. An Anú encourages the audience to connect with, to embrace and to open their hearts to the appreciation and conservation of the ancient and magical landscape of Connemara in the west of Ireland. This is done through relaxed spoken word between musical pieces and songs (with arrangements that range from slow and soft to rythmnically powerful, and bring drama and impact to the show) and visual art, in a concert setting.